The excellent 18-hole Links-style course at Eastern Star was designed and built by Robert Trent Jones Jr, one of the foremost international designers of championship golf courses. Playing to a par 72 over 7,134 yards from the Blue tees, and set among 530 acres (1,400 rai) of a former coconut palm plantation. 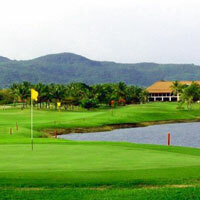 It offers plenty of challenge for the experienced golfer, but also offers solid enjoyment for beginners. It is a "thinking man's course" that can be successfully navigated with a little strategy and well-positioned shots.